Fixel EdgeHancer is Multi CPU accelerated and compatible with Adobe After Effects CS5, CS6, CC, CC 2014 & CC 2015. Fixel EdgeHancer 2 User Manual. OS X 10.7 and above. Windows Vista / 7 / 8 / 8.1 (64 Bit Only). Adobe After Effects CS5, CS5.5, CS6 or CC (All CC versions) 64 Bit. Installation of the Plug In is manual by copying the Plug In file into After Effects' Plug In folder. 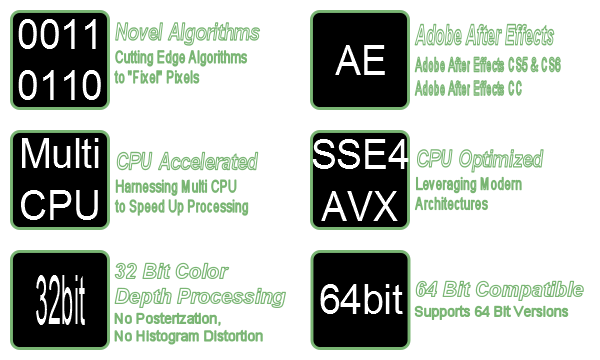 Support for After Effects CS5 & CS6 (64 Bit, OS X and Windows) using Adobe After Effects SDK. New C++ based code for greatly improved performance utilizing Multi Core CPU. Currently, GPU acceleration is enabled under Adobe Photoshop CS5 only (Using Pixel Bender Code). Please remove previous versions of Fixel EdgeHancer from the installation folder prior to copying Fixel EdgeHancer 1.6. Improved Edge Enhancement Algorithm. Better performance, Higher quality. Improved "Thresholding" Algorithm. Allows noise amplification full control. Please remove previous versions of Fixel EdgeHancer from the installation folder prior to copying Fixel EdgeHancer 1.5. Solved some issues in MAC OSX. Please remove Fixel EdgeHancer 1.0 from the installation folder prior to copying Fixel EdgeHancer 1.01.